Joe Smith, CEO and Founder of the NY Bagel Scam aka NYC Bagel Sandwich Shop Scam continues to bully victims even after they know they’ve been defrauded. Two current victims are among those who refuse to be bullied. (UnhappyFranchisee.Com) A North Carolina victim (we’ll call him NC Victim) of the NY Bagel Cafe Craig’s List Bagel Shop franchise scam is standing up to the bullying of scammer Joe Smith and Dennis Mason. The victim claims that he has lost as much as $250,000 to the illicit bagel store scam and can no longer afford to keep the doors to his bagel shop open. Like many others who realized, too late, that they had been defrauded, NC Victim has decided to debrand and transfer the assets of his store to another owner. He has already notified Joe Smith that he is aware that his contract is invalid, and that Joe Smith and his partner-in-crime Dennis Mason (who goes by fake names such as Brian Scofield) sold him an illegal franchise in violation of state laws and Federal Trade Commission (FTC) regulations. Namely, Joe Smith and Dennis Mason provided bogus franchises documents and failed to disclose, as required by law, their extensive histories of civil litigation and unpaid judgements, bankruptcies, and numerous state investigations, fines, and enforcement orders for fraud and deceptive sales techniques. Joe Smith and Dennis Mason claimed that NY Bagel Cafe was a new and growing chain with zero failures when, in fact, dozens of franchises had opened and failed, and many more victims had paid fees of tens of thousands of dollars and never got a store open. Even after informing Joe Smith that he was aware of his fraudulent actions, scammer Joe Smith is still trying to bully NC Victim into turning over his location so that he and Mason can fraudulently induce another victim into paying the now NYC Bagel Sandwich Shop franchisor to take it over. We have made multiple attempts to contact the both of you about past due balances and operation of the store with no response, It has also come to our attention you have switched your beverage provider to Pepsi from our National Vendor Coke you are not authorized to make a switch without our consent, Also Be advised we are in contact with Scott your landlord, and he informs us that there will be a transfer or sale between you two. I advised Scott that [Victim’s Names redacted] has a Valid Franchise agreement and Franchise Rider that states any transfer or Sale must be Approved by Corporate and the Location has to Stay a NY Bagel Cafe & Deli anything other than that will result in Stiff Legal Action against all parties involved. The NY Bagel Scam Team is now testing a new strategy: Bullying their fraud victims through an American Arbitration Association (AAA) demand filed by the Norris McLaughlin law firm of Bridgewater, NJ. Even after CO Victim (who has already lost $30,000 to the scam), who has not opened a store and is represented by counsel, confronted Joe Smith about the fraud allegations, she received a notice that Joe Smith’s latest shill corporate entity was demanding $50,000+ for her breach of the unlawful, bogus NY Bagel franchise agreement. as required by the rules. We note that the demand specified monetary damages of $50,000 as well as additional non-monetary relief, including declaratory relief. balance of the fee due on your non-monetary claim. Upon receipt of the above, AAA will proceed with further administration. So it appears, in this layman’s opinion, that as long as they receive a portion of NY Bagel and Joe Smith’s ill-gotten loot, the Norris McLaughlin law firm, attorneys Steven Reed and Anthony Caruso, and the American Arbitration Association (AAA), Mariah Price and James Daubert are more than happy to help with the Victim Bullying. Once you take everything from a victim, that victim no longer has anything to lose. It’s hard to bully someone with nothing left to lose. In the end, they decide they just want to try to prevent others from becoming victims to your and Dennis Mason’s NY Bagel scam. And we’re here to help them do just that. NOTE: All individuals, groups and companies discussed on this site are invited to provide corrections, clarifications, rebuttals or alternative viewpoints for publication. Contact ADMIN at UnhappyFranchisee[at]Gmail.com. 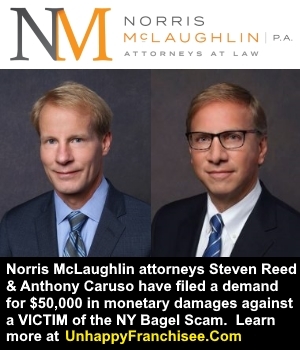 ARE YOU FAMILIAR WITH NORRIS McLAUGHLIN LAW FIRM, STEVEN REED, ANTHONY CARUSO, THE NY BAGEL CAFE aka NYC BAGEL SANDWICH SHOP aka NEW YORK BAGEL SCAM, JOE SMITH, DENNIS MASON (AKA BRIAN SCOFIELD)? PLEASE SHARE A COMMENT BELOW. ← Are Norris McLaughlin, Steven Reed, Anthony Caruso Suing Fraud VICTIMS?